Whether you are making romantic plans for Valentines Day that include dinner, wine and roses with another person, or if you’re celebrating the strength of being single and confident, Evy’s Tree would like to help you feel as fabulous on the outside as you are on the inside! Welcoming Zoe to our world of luxury and comfort! 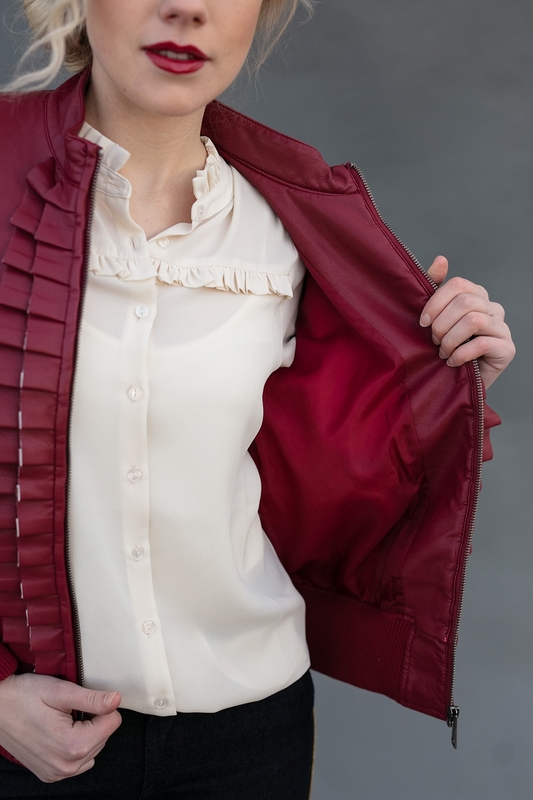 Zoe is an eye-catching vegan leather bomber with a fun pleated ruffle down the front, slightly reminiscent of the vintage Simple hoodie ruffle and left raw to allow slight fraying to add to the subtle edgy feel. It features a gorgeous and timeless mandarin collar and two front side zipper pockets to hold your small essentials. 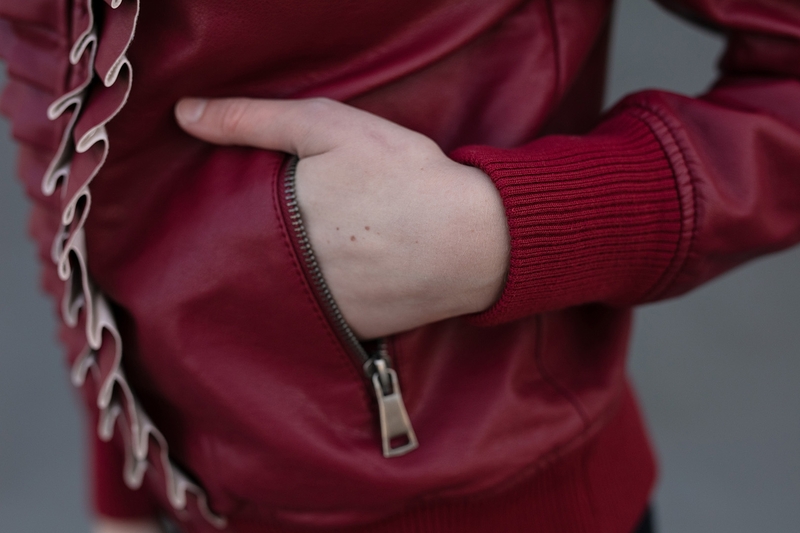 The Zoe is a deep red color, with dyed to match rib cuffs, and is perfect for celebrations ranging from Valentine’s Day to Christmas or to just celebrate your fantastic self! Wear with torn jeans, your favorite leggings, or a simple skirt and the Zoe will give your ensemble a soft feminine flair along with an edgier leather rock and roll vibe. So grab your stiletto heels, ankle boots or favorite sneakers and rock the brilliant woman that you are! The Zoe is true to size and meant to be layered over lighter weight pieces. If you are between sizes, have curvier arms and prefer a looser fit, or prefer a slightly longer torso length sizing up might be your best option. Otherwise you could stay in your usual size.